Prof. Ashraf H. Shaalan is the Chairperson of COMSATS’ Coordinating Council, comprising the Heads of Centres of Excellence. He was elected as Chairperson in the 19th Meeting of the Council held in Islamabad, Pakistan, in May 2016. 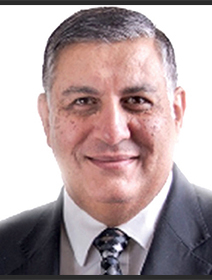 Prof. Ashraf H. Shaalan is the former President of National Research Centre (NRC), COMSATS’ Centre of Excellence in Egypt, which is affiliated to the Egyptian Ministry of Scientific Research, since November 2009. Prof. Shaalan did his MB.B.Ch. (Bachelor of Medicine, Bachelor of Surgery) in 1983 from the Faculty of Medicine, Ain-Shams University, Egypt. He completed his Ph.D in Childhood Studies from the Institute of Postgraduate Childhood Studies of the same university in 1993. Previously, Prof. Shaalan was the Vice President of the Academy of Scientific Research and Technology from August 2008 to November 2009. From September 2004 to January 2009, he served as the Head of Medical Research Division of NRC. Prof. Shaalan is a member of the Presidential Council for Education and Scientific Research since August 2014. As the President of the largest interdisciplinary research institute in the Middle East, Prof. Shaalan has devoted himself to the promotion of interdisciplinary research cooperation among NRC’s 110 research departments, covering the major areas of industry, health, environment, agriculture, basic sciences and engineering. Under his leadership, the Centre successfully executed its 9th and 10th research plans (2010–2013 and 2013–2016, respectively). Currently the NRC is pursuing its 11th research plan for the years 2016 to 2019. The research work carried out by Prof. Shaalan mainly concerns Paediatrics and Anthropology. Having a wide experience in science and technology management, Prof. Shaalan played an active role in preparing Egypt’s science, technology, and innovation policy; and building partnerships among analogous academia, government and industry. At international fora, Prof. Shaalan succeeded to enhance research collaboration with many countries such as Italy, Germany, France, USA, China, India, Russia, and Japan through joint research projects. He fortified the collaboration with many international organizations; namely DAAD, JICA, British Council, CIDA, SIDA and IDB. Prof. Shaalan has been a proponent of regional collaboration in science and technology. He has actively contributed as Member of the National Flour Fortification Alliance, selected by the United Nations World Food Programme (2007); and Co-founder of Middle East and North Africa Nutrition Association – MENANA (2004). He is founder, co-founder and member of many scientific societies in Egypt and abroad. He is also the head of Egyptian National Nutrition Committee and has served many other scientific committees as member. Medallion of Moulay Ismail University, Meknes, Kingdom of Morocco. As an academic, Prof. Shaalan has published more than 40 articles in local and international scientific journals. The theme of majority of these studies is child growth and development, child nutrition and assessment of nutritional status. He is also the Editor of the Egyptian Medical Journal of NRC (MJNRC) and member of scientific board of many other scientific journals.